When searching for the perfect Bluetooth headphones for running, there are some qualities that are necessary. Among these are battery life, sound quality, comfort, and affordability, not to mention if they are good for both jogging inside on a treadmill or outside running. 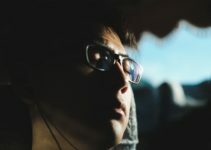 Reviews are a great way to see the reputation of the headphones you are looking into, and to make the determination that they are worth the investment. It is also important to read the descriptions provided on the website for each product, making sure that all the features you want are included in that particular set. 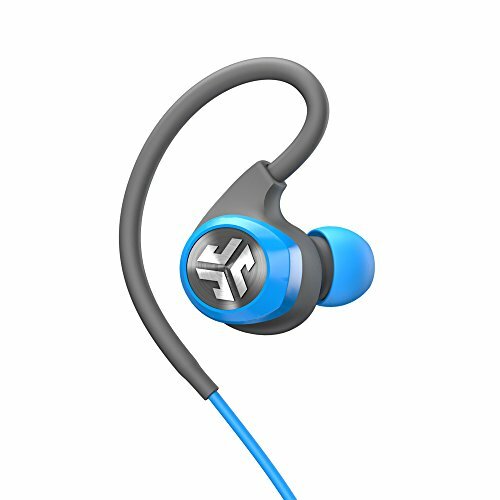 In this buyers guide for The Best Bluetooth Headphones for Running, we have put together not only a step by step guide to what to look for in a bluetooth headphone specifically for running, but have come up with our top list of 10 great Bluetooth headphones currently on the market that would be appropriate for an exercise or running enthusiast. These bluetooth headphones are completely “running-friendly” headphones and can cope with all sorts of weather come rain or shine or even snow! Why not take a look at our running headphones comparison chart to see all of the most popular and best running headphones. Our comparison table is just below the headphone reviews or you can click here to jump to it. Why Should Runners Use Wireless Headphones When Running? Below we have listed what we feel are the best headphones for runners in 2019. We have tried and tested all these headphones to bring you the top ten that are out there available to buy now. If you’re a frequent runner or gym rat, you need a pair of Bluetooth headphones that can keep up with your active lifestyle. The JayBird JBD-X4-001BMF X Sport Bluetooth Headphones will do just that, offering a plethora of features that are a must-have for when you’re working out. The first, and what some runners will argue is the most important characteristic, is that the JayBird headphones are completely sweatproof. No matter how much you sweat during a workout, you can rest assured that it won’t have any impact on the longevity of this device. The secure fit of these headphones will also guarantee that whether you’re running in place or running down the street, these headphones will stay in place. Not only do these headphones provide excellent audio for your music but they also work perfectly to take calls as well as they provide crystal-clear sound. With 8 hours of play time on one charge, you don’t have to worry about these headphones cutting out in the middle of your favorite song or an urgent phone call. If something does happen to your headphones, JayBird offers a lifetime warranty. Just send your damaged headphones to them and you’ll have a brand new pair in no time at all. Inspired by basketball legend Lebron James, the Powerbeats 2 Wireless In-Ear Headphones combine the technology found in your average Beats By Dre set of headphones with a small shape that is perfect for runners. 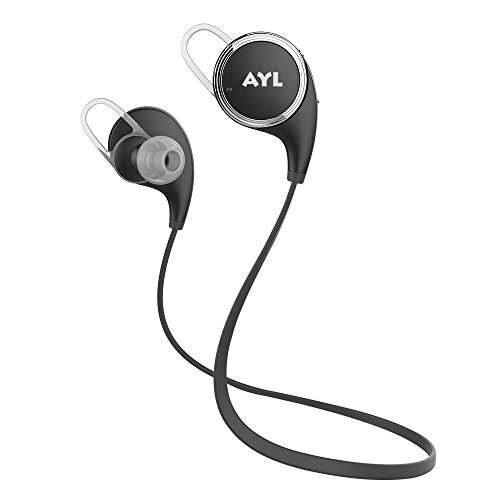 Not only are these headphones sweat resistant but they are water resistant as well, which is ideal for workout enthusiasts who like to swim as well as run. Not only are the headphones themselves resistant but even the cable is as well! With the no-slip-grip RemoteTalk control device, you’ll have no problem changing your music track or taking a phone call no matter how much sweat you’re putting out. With the Powerbeats 2 Wireless In-Ear Headphones, you get more than just stellar, high-quality audio, as these headphones come with a full array of extra goodies. In addition to a charging cable, you’ll also receive a carrying case and a cable management clip, both of which will help you get the most out of this set of headphones. Also included are four sets of ear tips, letting these headphones fit almost any size ear canal. With such a high-quality set of headphones at your disposal, you’ll want to use them for all of your workouts; luckily, these headphones can hold a charge for up to six hours, making them a perfect choice for even long workouts. Don’t like the feel of in-ear headphones? 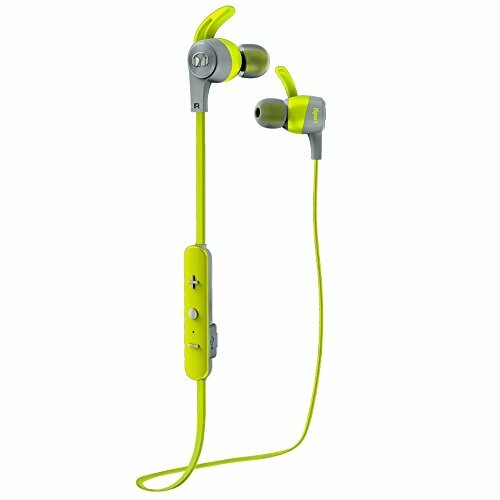 Then check out the Monster iSport Freedom Headphones. 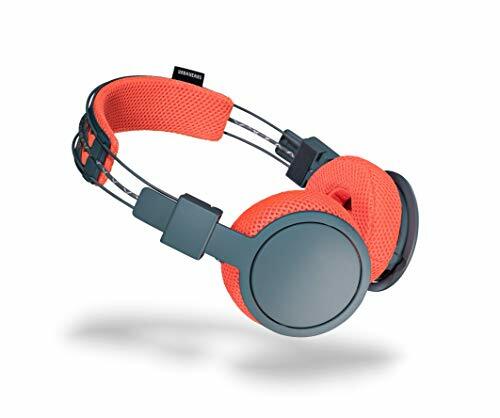 Right from the very first glance you’ll see that these headphones are perfect for runners; with their bright yellow exterior, these headphones will ensure that other pedestrians and drivers will see you even in the dead of night. While these headphones are sweatproof, all other dirt and grime they accumulate are easily rinsed clean. Not only is the Monster iSport Freedom headphones extremely durable but they are also UV-protected, so you can rest assured that even after years of direct sunlight, these headphones will still look and function like they were brand new. The proprietary Pure Monster Sound found in these headphones delivers clear audio that will let you hear your music like never before. The included controls let you switch music tracks or even take a phone call at the push of a button. By using Bluetooth wireless technology, you won’t have to worry about wires getting in the way of your workout: Just put these headphones on, pick your favorite song and start running. At first glance, the Jabra Sport Pulse Wireless Bluetooth Earbuds with Built-In Heart Rate Monitor looks just like any other pair of headphones. However, once you start running, you’ll see just how different these headphones are. No longer will you need to rely on old methods of checking for your pulse, as the Sport Pulse headphones monitor your heart rate at clinical-grade accuracy. When you’re looking to hit a particular level of intensity and want to know where your heart rate is at every second, this is a must-have feature. The heart rate monitor isn’t the only feature that makes the Sport Pulse headphones worth buying. Jabra has made sure these headphones are built for even the roughest conditions, making sure they are impervious to rain, shock, sand and dust. 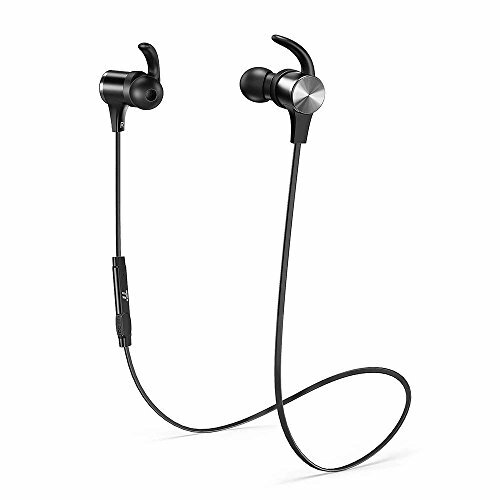 Using proprietary locking technology, once the Jabra Sport Pulse Wireless Bluetooth Stereo Earbuds are in your ear, they aren’t coming out until you want them to come out. With the free Jabra Sports Life application for your smartphone, you can sync up these headphones to your device to plan and monitor your performance. In fact, the app will even give you real-time coaching directly into your headphones to help ensure your workout is the best that it can be. 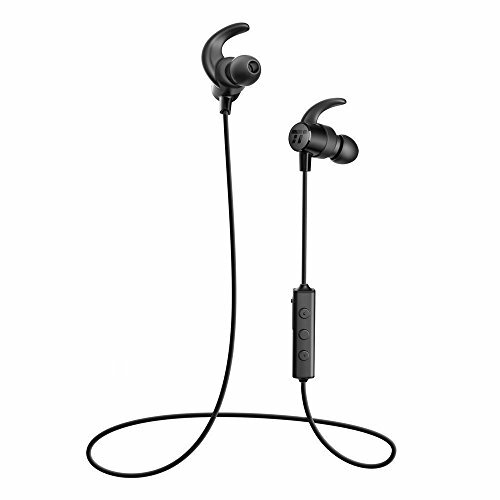 If you love the features in the Monster iSport Freedom Headphones but want something a bit smaller, then you’ll love the Monster iSport Bluetooth Wireless SuperSlim In-Ear Headphones. These headphones feature the same great Bluetooth technology, a vibrant green color and also both sweatproof and easily washable. 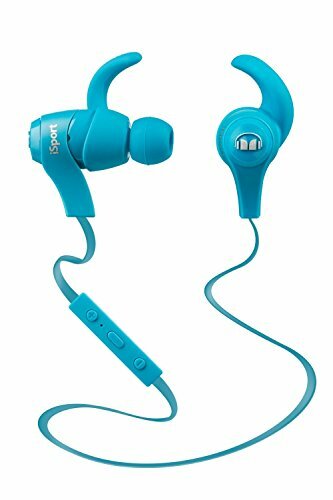 Where the Monster iSport Bluetooth Wireless SuperSlim In-Ear Headphones stand out is in their small, compact size, sliding directly into the ear canal. These headphones don’t trade size for sound quality either, as they deliver a pristine aural experience that will blow your ears away. The Control Talk cable lets you quickly change music tracks or the volume without ever needing to take your eyes off the trail. Available in red, black and white colors, Pioneer guarantees that there is a pair of Pioneer SE-E721 headphones for even the pickiest fashionista. A good pair of headphones needs to be more than just stylish, and luckily Pioneer has packed these tiny headphones with a wide array of features. Unlike other headphones on this list, the Pioneer SE-E721 specializes in providing a deep bass sound, perfect for those who like to listen to techno or rap while they run. With four different fit options to choose from, these headphones not only sound great but they fit great as well. 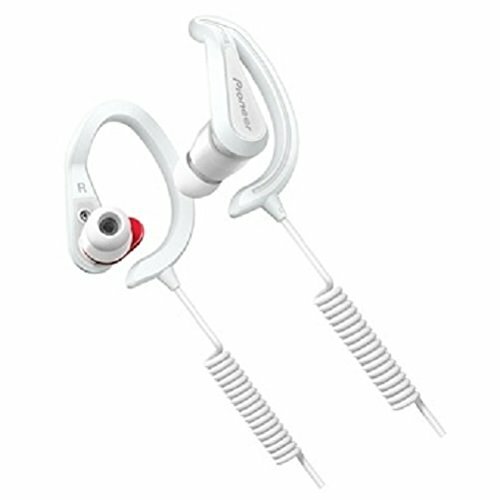 The Active Fit technology found within these headphones will help to keep them in your ear no matter how fast you run. Using a proprietary drip-proof coating, not even copious amounts of sweat will cause these headphones to fall out or malfunction. The dual curl cord on the Pioneer SE-E721 helps to make sure that the wire doesn’t become tangled either during a run or in your backpack. With a 1.2m cord, even the tallest of runners won’t have an issue getting these headphones to their ears. The signature Pioneer durability is also present on the Pioneer SE-E721, letting these headphones take even the roughest of abuse and come out with no scratches. When running, you don’t want a pair of headphones that is going to slow you down with their weight. The Sennheiser PMX 685i Sports In-Ear Neckband Headphones are some of the lightest headphones in their size class, according to Sennheiser. Not only are these neckband headphones light but they provide fantastic sound, including acoustically fine-tuned high volumes and low bass which gives a satisfying punch to any music track. The in-line controls allow you to change both the music track and the volume on the fly with the push of a button. The open design of the headphones speakers serve a dual purpose; not only do they contribute to that high-quality audio but they also provide a high degree of comfort as well. The secure holding mechanism ensures that these headphones stay in for the duration of your run while the shock-proof material ensures that even years down the line, the Sennheiser PMX 685i Sports In-Ear Neckband Headphones will still work correctly. 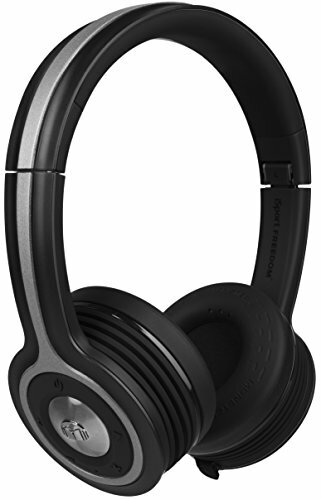 Lastly, while these headphones work on a variety of devices, they are specifically optimized for Apple devices, including the iPhone and the iPod touch. 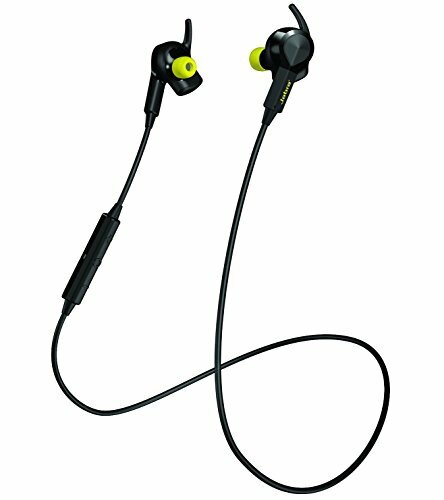 While plenty of headphones offer noise suppression technology, the Monster iSport Victory In-Ear Headphones are one of the few out there that claim to offer total noise isolation. While not ideal for outside runners, as you need to be able to hear your surroundings at all times, these headphones are perfect for those who do their running on the treadmill or frequently work out at the gym. These headphones are also both sweatproof and waterproof, so they’re not just ideal for the gym but also for the pool as well. Whether you’re running at breakneck speeds or taking a dive into the pool, the patented SportClip design that Monster uses on the Monster iSport Victory In-Ear Headphones keeps the headphones in your ear at all times. The comfortable design of these headphones let you wear them for hours on end without experiencing even the slightest bit of pain or discomfort. As you’d expect from a Monster product, these headphones sound fantastic, with vocals coming through in crystal-clear clarity being complimented by low bass noises. When you’re looking to get into the zone and stay there, the Monster iSport Victory In-Ear Headphones are one of the best choices you could make. With the word epic right in the name, the JLab Epic Bluetooth 4.0 Wireless Sports Earbuds have a lot to live up to; luckily, JLab packs in so many high-quality features that these headphones easily earn that designation. These headphones have won several awards and it’s easy to see why, as they feature a sleek design that is both durable and light at the same time. However, what makes the JLab Epic Bluetooth 4.0 Wireless Sports Earbuds stand out is their battery life: over 10 hours. With the C3 sound technology and 8mm drivers, you’ll be thankful for the long battery life as you’ll want to use these headphones even when you’re not working out. While these JLab earbuds sound, look and feel great, where they shine is in the extra features. With each JLab Epic Bluetooth 4.0 Wireless Sports Earbuds purchase, you’ll receive three months of the RockMyRun Rockstar premium app. 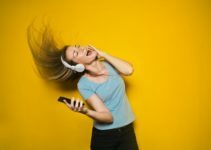 This premium application lets you listen to music without those pesky commercials and even allows you to create and listen to playlists. 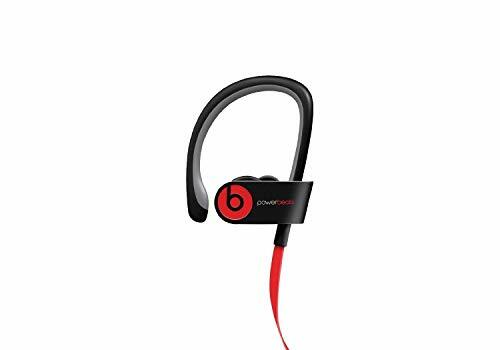 When you’re done working out and listening to music, just run these headphones under some warm water and they’ll be ready for the next fitness session. Even though the Urbanears Hellas Headphones are one of the most expensive headphones on this list, their price tag is justified due to the number of features they pack. While you get the standard features such as sweatproof padding and Bluetooth wireless technology, you also get a sleek swipe interface and a built-in microphone. With such great features, these headphones are not just ideal for running but also other activities as well, such as plugging them into a gaming console or just relaxing and listening to music. In addition to being sweatproof, the Urbanears Hellas Headphones are also comfortable, thanks to their mesh ear cushions. Whether you wear these headphones for a few minutes or a few hours, you’ll be amazed at how great they feel on your ears. When it comes time to wash your Urbanears Hellas Headphones, just remove the headband and throw everything in the wash.
With their 40mm handmade drivers and 50mW max input power, these headphones provide a sound experience that will blow you away. Whether you’re listening to smooth jazz or hard rock, these headphones deliver an aural experience that will make you feel like you’re watching your favorite band live. You don’t need to spend a fortune on running headphones to be able to exercise with your favourite tunes playing in your ears. You can get great quality sound and comfort with headphones that cost $50 or less. Check out our top ten budget running headphones and see if any of these are a good fit for your running sessions. The iDeaUSAs are of the same cable design as the Kengadgets. 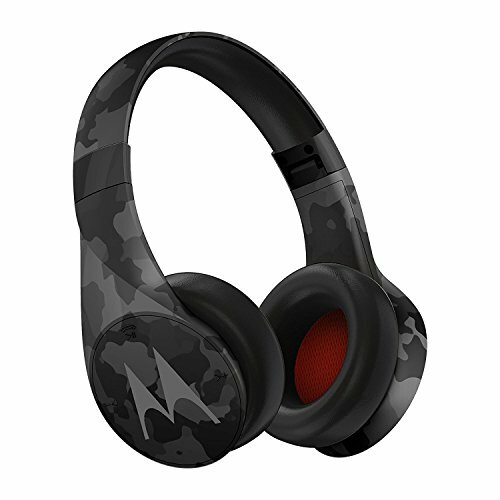 They have Bluetooth 4.0, a built-in microphone, noise cancelling technology, and are sweat proof. They also have apt-x, which is said to give high quality sound. The packaging includes 3 pairs of ear hooks, sized small, medium, and large. There are also 3 pairs of ear tips, sized small, medium, and large as well. Mixing and matching will allow you to find the combination that is right for you. They have volume controls and a power button that also functions as the call answer button. With these headphones you can pair 2 devices at a time. The battery lasts up to 5 hours for listening time and about 175 hours of stand-by time. A low price doesn’t necessarily mean low quality, as the Motorola Pulse Escape + Wireless Over-Ear Headphones prove. This Bluetooth headset packs in just as many features as headphones twice the price. The Motorola Pulse Escape + headset uses two 40mm drivers to generate high-quality audio that features both punchy bass and sublime fidelity. When it comes time to make or receive a phone call, you’ll find the same commitment to superior quality; both your voice and your recipient’s voice will be crystal-clear thanks to the high-quality microphone located in the device. If a call comes through while you’re listening to your music, it’s no problem; the Motorola Pulse Escape + headset will automatically pause your music while you take the call. In the event that you need to edit some settings on the fly, such as increasing the volume or muting the headset altogether, the Motorola Pulse Escape + features controls located directly on the headset itself. You can even change your music tracks, make and accept calls by using these controls. With such a wide array of features, you’re going to want to use your Motorola Pulse Escape + Headset for extended periods of time. Luckily, the headset’s battery holds a charge for 20 continuous hours of talk or music, so you don’t need to worry about it going dead in the middle of an important conversation. With the headset’s curved design, comfort won’t be an issue as this headset is both lightweight and will rest comfortably across the contours of your skull. In addition, the headset also features cushioned earcups that are so soft, you’ll forget you’re even wearing them. These latest sports headphones from TaoTronics come stacked with features. The latest Bluetooth 5.0 technology and cVc 6.0 noise cancelling mic are just the tip of the iceberg. There are handy features such as magnets built into the casing so that the headphones can be attached together and safely stored without fear of snagging the wires. Also handy for when the real world interrupts and you need to remove the earbuds, rather than dangling awkwardly they can clip together and hang neatly round your neck. The TaoTronics BH07 also come stacked with ear hooks, charging cable and 3 sets of ear tips. From a 2 hour charge you get up to 9 hours continuous playtime and up to 80 hours standby time. In terms of sound quality, the TaoTronics BH07 use the aptX codec, for high quality sound. This set is compatible with most devices, including iOS and Android devices. The Aukey Key Series B60 Bluetooth Headphones come in neutral grey and are another model that feature convenient magnet functionality within the casing. This time though, the magnetic casings have an additional function providing a button-free method of powering off the headphones. Just stick the earplugs magnetically together. The Aukey Key Series B60 have Bluetooth 5.0, but as Bluetooth is backward compatible, even if your connectable devices are only rated for Bluetooth 4.2 or previous versions, you will still be able to connect. The IPX6 water-resistant rating will keep your headset safe when running in rain or shine. From a single charge you get up to 8 hours playback and the Aukey Key Series B60 come with a 45-Day Money Back Guarantee. In the box you will receive your headset, 2 sets of ear tips, ear hooks, carry pouch, charging cable and user guides (including quick start). 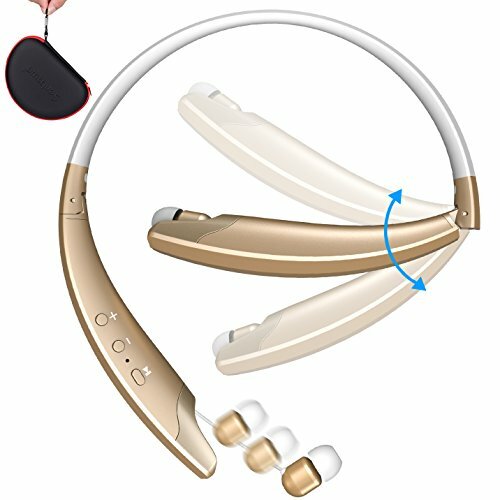 With 150 reviews and 4.3 stars, the Senbowe headset has a good reputation. 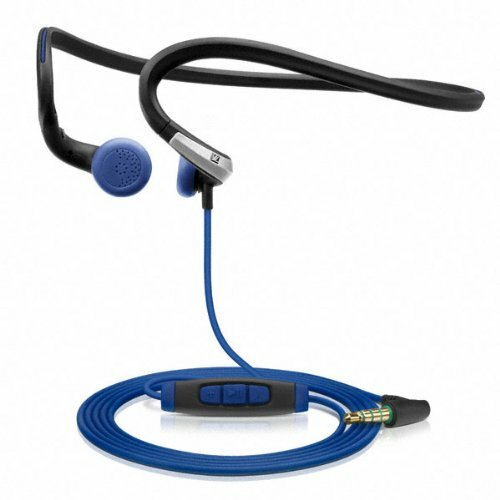 It has the popular single cable design, built-in microphone, volume controls, and ear hooks. The Senbowe has Bluetooth 4.1 and supports apt-x. It has echo and noise cancellation technology. This allows for better call quality. The ear caps are designed with “human engineering” so that they fit snug in the ear. The battery lasts approximately 4.5 hours for playing time and charging time can range from 1 to 2.5 hours. The Mpow Jaws Gen-5 Wireless headset for running comes in the form of a neckband with adjustable earbuds, and comes in jet black. The Mpow Jaws Gen-5 are another model that come with cvc 6.0 noise reduction technology for crisp and crystal sound, and clear use of the mic when making and receiving calls. It is equipped with Bluetooth 5.0, call vibrate, magnetic cable adjustment and easy button control to name only a few of the features. There is an 18 month warranty and 45 days money back guarantee as standard. The battery can last up to 18 hours of music playback time, and up to and incredible 450 hours of standby with a single 3-hour full charge. The TT-BH16 comes with Bluetooth 5.0, apt-x, and are sweat proof. It comes with 3 differently sized ear hooks. The ear hooks are curved, making it easier for them to stay tucked into the ear. For those that do not like the curved design, there are 2 rounded ear hooks, small and large. Also included in the packaging are a set of small ear tips and a set of big ones. With all these choices, you are bound to find a combination that fits comfortably in your ear and stays in place. Battery life gives up to 7-9 hours of talking or music time, or about 175 hours of stand-by time. The range on the TT-BH16 is 33 ft. This model has a built in antennae and cVc 6.0 noise cancelling mic technology. The earbuds are connected by a 22 inch cable. The ear hooks have been reviewed to effectively keep the earbuds in place. It has Bluetooth 4.1 and apt-x audio. They also have noise cancelling technology, a microphone, and are sweat proof. Unlike other that just seem to have volume controls, these have volume, sound, song selection, and phone controls on the earbuds. You can pair these with 2 devices at a time with a range of 10 meters. The battery allows 7 hours of playing time and 175 hours of stand by time. For myself and most runners, I prefer to use Bluetooth Headphones over the traditional wired headphone. Reason for this is that I can get out of the house a lot quicker and less hassle when I don’t have a long old wire to connect up to my MP3 player or smartphone. Also I like the feel of not having a wire flapping around while I run or having the effort to conceal or tuck it into my pants or under my running top. Yes they cost a bit more, but the convenience it gives you is so worth it! The only downside to Bluetooth Headphones is that they do run out of power quickly and if you forget to charge them up at the end of your workout, there is no option to turn them into a wired connection. As I mentioned before, wireless headphones give you that extra freedom and convenience of being able to just put them on your head and work out without the hassle of having to deal with untangling wires before going running. Not only that, all those minutes lost every time you have to untangle your headphone wire all add up to hours, even days when you think of it over a lifetime. There’s also the potential damage to headphones when the wire connection becomes loose from wear. The bottom line is wireless headphones are more comfortable when you’re running, playing sports or working out. Why have the added baggage of wires? This is the 21st century after all! Before you sprint off to the shop or Amazon, you should really consider the following when buying a pair of bluetooth running headphones. Where will you be using them the most? Are you a runner who likes to run in the rain, sleet and snow? If so then you need to make sure the headphones you get are water-proof. If you like running on a treadmill / running machine, then you’re going to be sweating a lot more that you would do outside, so a sweat-proof set of headphones is essential for you. Earbuds which are placed inside the ear or also known as (IEMs). Headphones that go on the ear, also known as (On-ear). Wireless Earbuds with Bluetooth connectivity.